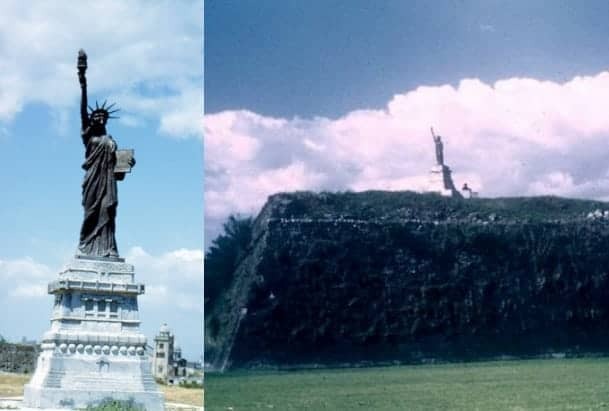 Whatever Happened To Manila's Statue of Liberty? Not many people today remember that a Statue of Liberty–just like in New York–used to be a landmark in Manila. 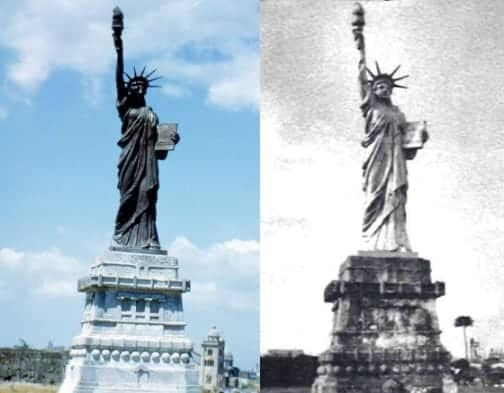 This replica, however, was not your ordinary imitation; it was a gift to the Philippines from the United States just as the original statue was a gift to the United States from France. 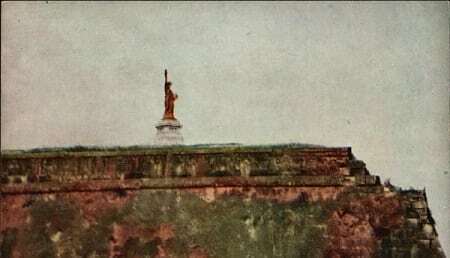 The eight-foot Statue of Liberty used to stand in Baluarte de San Diego in Intramuros but reportedly disappeared in the early 1970s. This article explores its whereabouts, its fascinating history, and what it symbolizes in the context of Philippine-United States relations. Statue of Liberty: A Brief History. Since its inauguration in 1886, the now-iconic statue, formally known as Liberty Enlightening the World, has become a symbol of freedom, the United States, and its close ties with France. After all, it was a gift to the Americans from the French who helped the former achieve freedom from the British in 1776. The 225-ton and 305-foot monument was designed by Frederic-Auguste Bartholdi, a French sculptor. It is said that Lady Liberty was modeled after Bartholdi’s mother, Charlotte, and it took him 10 years to complete the monument. Alexandre-Gustav Eiffel, a French engineer of Eiffel Tower fame, helped Bartholdi in the construction by suggesting the use of copper and building a steel frame for the monument. 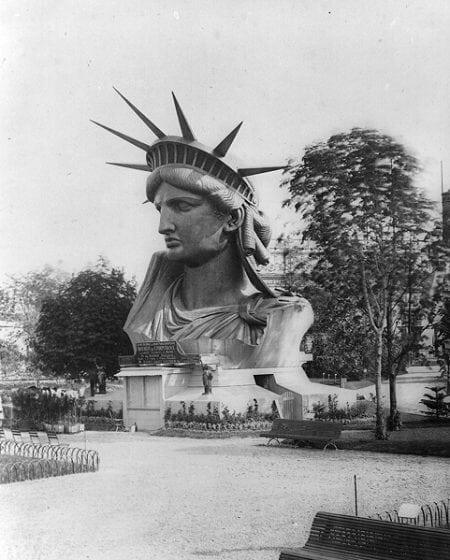 The Statue of Liberty’s head, on exhibit at the Paris Exposition of 1878. Source: Wikimedia Commons. Building the Lady Liberty was quite an expensive endeavor for France, and it was the lack of funds that delayed its construction. Fortunately, the cost was covered through donations, a French lottery, and a benefit concert at the Paris Opera, among others. As for the statue’s base and pedestal, America was able to defray the expenses through Joseph Pulitzer, a newspaper magnate who used his New York World to raise awareness and ultimately earn donations to complete the project. The monument was installed in Bedloe Island (now Liberty Island) in the New York harbor. It not only serves as a national icon but also as a gateway that welcomes millions of immigrants who come to America with hopes of a better future. Fast forward to 1950, the Boy Scouts of America was celebrating its 40th anniversary. Jack P. Whitaker, then Scout Commissioner of the Kansas City Area Council had earlier suggested the creation and distribution of several Statue of Liberty replicas to all American states and territories, including the Philippines. The eight-foot statues, which were cast in bronze, were distributed all over the U.S. and the world from 1949 to 1951. Almost 200 replicas were delivered to the 39 states of the U.S. and countries such as Panama and Puerto Rico. The Boy Scouts of the Philippines, on the other hand, received its own replica in the early part of 1950. 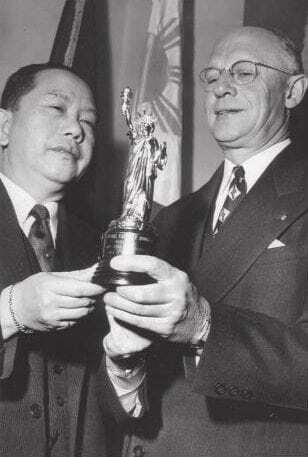 Chief Scout Executive Arthur A. Shuck presented Carlos Romulo with a miniature of the Statue of Liberty in April 1950. Photo Credit: “Filipinos in New York City” by Kevin L. Nadal and the Filipino-American National Historical Society, Metropolitan New York Chapter; page 33). Miniature versions of the statue were also given as gifts. In fact, the Philippines became the first independent nation to receive one of the 4,000 eight-inch statues from the Boy Scouts of America. 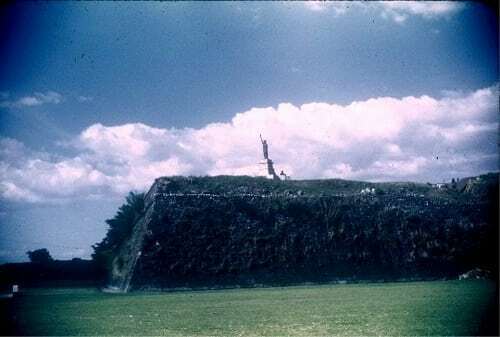 In April 1950, the said statue was officially given by Chief Scout Executive Arthur A. Shuck to Carlos P. Romulo, then chief of the Philippine Mission to the United Nations. In the end, the Boy Scouts of the Philippines (BSP) erected the statue just outside Intramuros. As the icon of the United States, the replica of Lady Liberty would survive several attacks by student protesters in the 1960s. It remained standing until the early 1970s when the BSP decided to transfer it to the Scout Reservation in Mt. Makiling which would serve as the statue’s home for two decades or so. 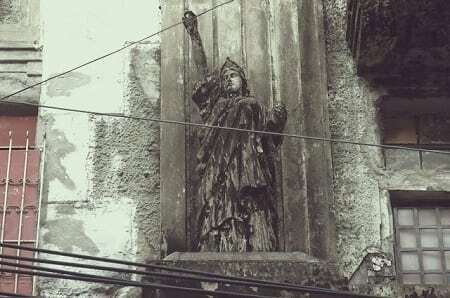 In a 2002 article published by the Philippine Star, then BSP PR head Nixon Canlapan revealed that the Statue of Liberty was eventually moved and stored at the BSP headquarters on Concepcion Street (now Natividad Almeda-Lopez) in Ermita, Manila. Unbeknownst to many, the American-sponsored replica was not the first Lady Liberty in Manila. In the 1930s, one of Manila’s biggest shopping stores at that time became the talk of the town not just for its products but also for its unique multi-story building. Located in Juan Luna Street, the L.R. Aguinaldo’s Emporium had an Art Deco facade featuring two contrasting statues: Andres Bonifacio on the right and the Statue of Liberty on the left. 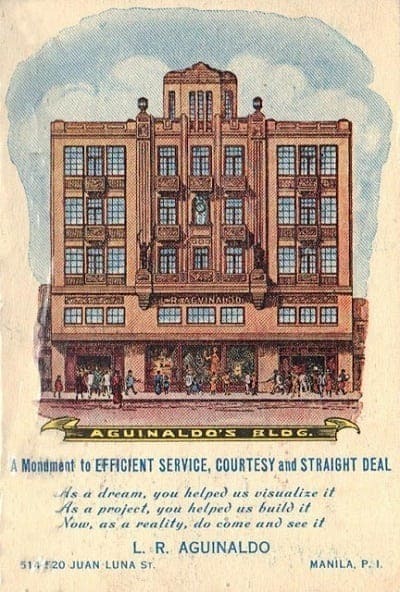 Established by Philippine retailing pioneer Leopoldo R. Aguinaldo, the store would later become known as the Aguinaldo’s Department Store. After the war, Leopoldo’s son Francisco took over the business and the store was moved to Echague. The Echague branch in the 1950s was known for introducing its customers to quality products both from the Philippines and abroad. It also commissioned young interior designers to update the store’s furniture section. Thus, the store catapulted the careers of famous designers like Myra Cruz, Edgar Ramirez, and Bonnie Ramos, among others. Aguinaldo’s succumbed to the competition and closed in the 1960s. The original building in Juan Luna Street still stands, along with both the Bonifacio and the Liberty statues. Aguinaldo Building’s Statue of Liberty today. Photo Credit: The Filipinas (thefilipinas.blogspot.com) by Paolo Bustamante. Since the creation of the Liberty statues in Intramuros and Juan Luna Street, other Philippine provinces soon followed suit. You can now find Statue of Liberty replicas in Pangasinan and as far as Camp John Hay in Baguio City. It’s also worth noting that the replicas now serve a purpose not too far from their original intention: to serve as a reminder that American influence is here to stay and will continue to be part of Filipinos’ daily way of life. Nadal, K. (2015). Filipinos in New York City (p. 33). Arcadia Publishing.